Kent's "Hooligan Libertarian" Blog: Holy Pole Quilt or else! 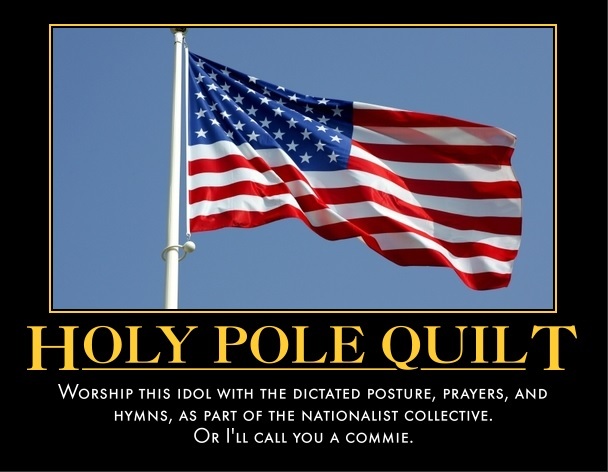 Holy Pole Quilt or else! A guy who lives across the street from my parents assumed I would be on his side. A new convenience store/truck stop in the area apparently doesn't fly Holy Pole Quilt. This offends the man. He told me he's going to go in, fill up a basket with expensive items, and when he gets to the register, ask why they aren't flying "The Flag". Then when the cashier says they "aren't allowed to", he's going to leave the full basket and say he can't spend money with them if they can't fly the flag of the country he "fought for". Ugh. Seriously? Does he only spend money with businesses which prominently display Holy Pole Quilt? I don't remember one flying over most of the grocery stores in the area, Walmart being the exception. This guy is a die-hard statist and militarist. He was sent to Vietnam as a youngster to murder (or support murderers) for the US government's interests. Unlike many others, this experience only deepened his worship of The State. He has a flagpole in the middle of his front yard, with Holy Pole Quilt illuminated by lights at night. He told me he's making soldier cut-outs to put in front of the pole, along with a big sign of statist propaganda about soldiers and "freedom". There's no doubt where his loyalties lie. And yet, he assumes I agree with him? He reads my newspaper columns and often tells me how much he enjoys them. Is he reading into the columns what he wants to see, or am I really that bad at communicating? Just so you know, I don't go around looking for fights. I didn't say a word to the guy about his misguided assumptions or horrifying religion. I may not have even rolled my eyes. I also didn't encourage him or agree with him in any way. I might have asked him if it's possible for a drafted soldier to "fight for freedom", but given the proximity to your parents house you probably made the right choice not to ring his cognitive dissonance bell. Yeah, I was just shocked he thought I would take his side on that issue. Where did that even come from? In his deluded and propagandized head the process probably went something like; I live in amerika, that's what I believe, so obviously that is what everyone else who lives here believes. An all too typical member of the herd.